Great product! Now my battery is fully protected against all that winter can throw at it. Very pleased! Bit to big for my 36 hole battery however works just fine. 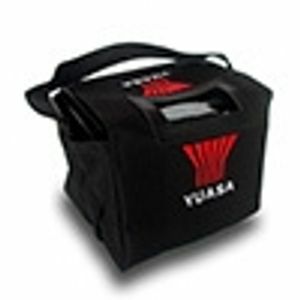 Value for money in lifting and protecting trolley battery. Very pleased with the quality of the product and prompt and efficient delivery. It is a good product and should keep the battery clean under the golf trolley and make it easier to move around. I like the slot for the top t-bar cable to go through too. Received this week so can only comment on the fit. It is slightly too big for the golf pro battery but is good quality with cutout for the tee bar connection and two fitted carrying handles. Delivery was excellent as was the customer service. Good fit and different length of handles a bonus. Very good. Bought a battery at same time which fits well. Seems strong and two handles to suit whichever way the battery sits on your trolley.